The beginning of the new financial year today brings cheer for the common man as his savings bank account will give him higher returns. But tax evaders are in for a bad time as the government readies to show them its teeth by imposing a higher Tax Deduction at Source (TDS) of 20 per cent if they fail to provide PAN details on any income received. Maruti Suzuki India today reported a growth of 11.04 per cent in its total sales in March at 95,123 units, boosted by the best-ever monthly export figures. The company had sold 85,669 units during the same month last year, Maruti Suzuki India (MSI) said in a statement. Hero Honda today reported 17.35 per cent rise in sales at 4,14,638 units last month, the best-ever figure reported by the company for March. The company had sold 3,53,342 units during March last year, Hero Honda Motors Ltd (HHML) said in a statement. Higher prices of milk and pulses drove food inflation up to 16.35 per cent for the week ended March 20 and this could, in turn, contribute to overall inflation touching double digits. Mumbai: Expressing concern over the rising prices, Prime Minister Manmohan Singh today asked the RBI to formulate policies that control inflation and pave the way for 9 per cent-or-more economic growth. Bharat Heavy Electricals Ltd (BHEL) today announced a quantum jump of about 37 per cent in the net profit for 2009-10 at Rs 4,287 crore against Rs 3,138 crore in the previous fiscal. Unable to sort out debt restructuring issues, Wockhardt today said its estimated Rs 650-crore deal to sell nutritional business to Abbott had been terminated, eight months after announcing the agreement. Larsen & Toubro and Rolls-Royce have inked a memorandum of understanding to address the need for light water reactors in India and abroad. The industry in the region is upset at the sharp hike in prices of steel. SAIL has increased steel prices by Rs 4,000 per tonne. Industrialists say that steel prices in this calendar year have already seen a jump of over Rs. 5,000 per metric tonne. The government has implemented these two landmark regulations. While one regulation will ensure that the common man gets a higher rate of interest on his savings deposits, the other regulation, which makes it mandatory for quoting Permanent Account Number (PAN), will help the government build up its tax database and tax information network. The higher tax (20 per cent tax as against regular rate of 2-10 per cent deducted at source on payments) will act as a deterrent for those evading taxes on income. The tax base is a mere 3.30 crore largely because of massive underreporting of income. It is mandatory to quote PAN on all documents pertaining to financial transactions notified by the Central Board of Direct Taxes like sale/purchase of immovable property or motor vehicle, payments in cash of amount exceeding Rs 25,000 or in connection with travel abroad. 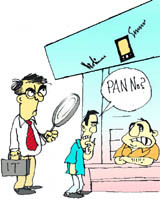 PAN is also to be mentioned for obtaining a telephone or mobile telephone and for making time deposit or cash deposit exceeding Rs 50,000 with a bank or post office. Senior citizens, who were earlier simply filing Form 15 H in absence of tax liability, too, will have to furnish their PAN details, or face a high TDS rate of 20 per cent. While this move may upset many, the higher returns on savings will definitely bring smiles on every one’s lips. With the RBI asking banks to shift to a new method of calculating interest on savings deposits on a daily basis, hundreds of thousands of account holders will get 30-40 basis point interest more on their deposits. At present, interest on the savings accounts is calculated on the minimum balance held from 10th day to the last day of the month. Though the interest will still be paid twice a year - in March and September, customers will now get 3.80- 3.90 per cent as rate of interest. With interest being calculated on a daily balance method, consumers gets the benefit of a higher base for investment calculation, especially in cases where amount has been lying in the account for a long period of time. It also reported a rise of 28.55 per cent in its annual sales during the 2009-10 fiscal at 10,18,365 units, as against 7,92,167 units during the previous fiscal, helped by a spate of new launches and product refreshments. Sales of the company's once bread-and-butter model M800 fell by 13.66 per cent at 2,430 units compared to 2,762 units in March, 2009, it added. The A2 segment (comprising Alto, WagonR, Estilo, Swift, A-Star and Ritz) also witnessed a fall of 1.18 per cent in sales during March at 54,763 units compared to 55,415 units in the same month a year ago. Hyundai Motor reported its highest-ever domestic sales at 31,501 units and posted a jump of 27.26 per cent over the same month a year ago. The company had sold 24,754 units in the domestic market in March 2009, Hyundai Motor India Ltd (HMIL) said in a statement. 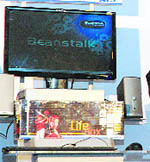 The domestic sales of the company is the highest since 1998, when HMIL launched Santro, it added. In its A2 segment (Santro, i10, i20 and Getz Prime), the company sold 50,715 units, while in the A3 (Accent and Verna) sales were at 4,276 units. The A5 segment (Sonata Transform) of HMIL witnessed sales of 44 units, while its SUV Tucson received no buyer during the month. For the entire 2009-10 financial year, HMIL registered 20.79 per cent jump in its total sales at 6,00,588 units against 4,97,206 units in the previous fiscal. Ford India reported an over three-fold jump in its March sales at 9,478 units on the back of its newly-launched hatchback Figo, getting a good response. Figo has already over 10,000 bookings in the last four weeks, Ford India said in a statement. Toyota Kirloskar Motors today reported 90.01 per cent jump in sales at 6,905 units during March, against 3,634 units in the same month last year. The company also raised the prices of its vehicles by up to Rs 23,000 on account of rising input costs and modification of engines to conform to emission norms, coming into effect from today. The company had in February surpassed the target of selling four million units during the fiscal. Suzuki Motorcycle India today reported a jump of 76.13 per cent in its sales in March at 21,752 units on the back of good response to its new products. The company had sold 12,350 units during March, 2009, Suzuki Motorcycle India said in a statement. Yamaha Motor today reported a 27.30 per cent growth in its sales in March at 27,460 units, boosted by good performance in the premium bike segment. The company had sold 21,571 units during the same month of last year, India Yamaha Motor said in a statement. During March, the maker sold 17,892 units in the domestic market as against 14,575 units in the same month of last fiscal, a rise of 22.76 per cent. Food inflation had hit a four-month low of 16.22 per cent in the previous week. In view of the rising prices of essential goods and fears of food inflation spreading to manufactured goods, experts feel the RBI can take more measures in its coming monetary policy on April 20 to contain price rise. The overall inflation, which includes variation in prices of food and non-food items, was 9.89 per cent in February and is estimated to cross double-digit mark soon. "I expect overall inflation to be at 10.7 per cent in March. To tame inflation, the Reserve Bank could take monetary tightening measures in the April policy by raising repo, reverse repo and cash reserve ratio by 25 basis points each," HDFC Bank economist Jyotinder Kaur said. Food inflation, she said, was likely to soften in the coming months but higher fuel cost would continue to put pressure on prices. On an annual basis, pulses became dearer by 31.55 per cent, milk prices 18.74 per cent and wheat 13.5 per cent. Addressing the Platinum Jubilee celebrations of the RBI, he said the monetary and financial policies must ensure that "inflation is kept under control as it hurts the common man the most and also distorts economic signals." “With such a strong base we have planned to recruit 4,000 personnels in the fiscal ending March 31, 2011," BHEL CMD B P Rao said here. The company has received orders worth Rs 59,031 crore in 2009-10 compared to Rs 59,678 crore in the previous fiscal and recorded the highest-ever orders from the private sector that placed orders for the 14,689 MW capacity. The total order book of the company was at Rs 1,43,800 crore, Rao said while announcing provisional financial results for the year 2009-10. Wockhardt, in a statement, said the company and Abbott had "jointly decided to terminate the nutritional business agreement signed by them in July, 2009". While, the company did not specify the reasons for terminating the deal, Abbott, however, said on its website that the decision was taken "because Wockhardt was unable to resolve debt restructuring issues with some of its lenders". Wockhardt's nutrition category comprises brands like Farex, Dexolac, Nusobee infant formulas and Protinex. Abbott had agreed with Wockhardt to acquire the nutrition businesses of Wockhardt Ltd, Carol Info Services Ltd and certain Wockhardt subsidiaries for an estimated $130 million or about Rs 650 crore. Meanwhile, in another filing to the Bombay Stock Exchange, Wockhardt said it had allotted 123.27 crore shares to four of its creditors on preferential basis, a part of its Corporate Debt Restructure (CDR) package. It had issued 83.99 crore non-convertible redeemable preference shares and 39.28 crore optionally convertible cumulative redeemable preference shares to four creditors, including the State Bank of India (32.50 crore shares), India Overseas Bank (3.9 crore shares), Punjab National Bank (93.26 lakh shares) and HDFC Bank (1.85 crore shares). Light water reactor technology is in use in over 60 per cent of the civil nuclear power plants operating worldwide. The companies have agreed to collaborate on areas, including nuclear instrumentation and controls, engineered products and systems, reactor components, engineering services, in-service reactor support and waste management, a release issued here said today. The agreement between Rolls-Royce and L&T followed the recent bilateral Civil Nuclear Co-operation Declaration by the Indian and UK Governments, which enabled industries of both the country to engage in civil nuclear commerce, the release said. "The agreement brings together rich experience and will effectively leverage strengths of both the companies to tap rapidly emerging opportunities in India, the UK and rest of the world," L&T's senior executive vice-president and board member M V Kotwal said. PD Sharma, chairman of Apex Chamber of Commerce and Industry, rued that it was a general pattern for major steel producers in the country to raise the prices in a cartelised manner. “Now other major steel producers like Tata Steel, Jindal Steel and JSW Steel and others are likely to effect similar increase,” he said. The one-time jump in the steel prices is rooted in the new paradigm for quarterly contracts for iron ore and coking coal. Earlier such contracts were yearly. The second reason is the spurt in demand for steel from auto, ship-building, construction, oil and gas and infrastructural requirements.